Retaining walls are used to retain grades, create level and usable spaces, and add depth and height to a landscape. Structural retaining walls or walls over 4′ in height will often require an engineer to design them, and the local county’s approval of the projects design and installation. Most of the time, we design retaining walls that do not require all the engineering investment, and it is rare that we need to go to that expense with residential landscapes. Living in the mountains usually means you have a property that will require some type of retaining wall incorporated into the landscape. We have been constructing retaining walls in Evergreen, Colorado and the surrounding communities of Conifer, Morrison, Genesee, Golden and the Denver Metro area for 15 years. Retaining walls in Evergreen, Colorado, are often constructed to create other spaces, like patios, walkways, playground areas, or lawns. After a home is constructed, it is common for the excavators of the home’s property to leave unfinished, dug out hillsides. That’s where Evergreen Landscape & Design comes in. We can help to finish the home with retaining walls that both provide structural integrity and a beautiful fished look. 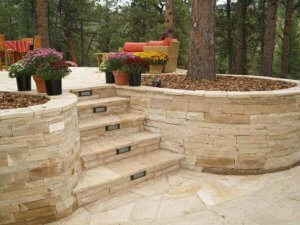 Retaining walls require special skill from design to installation. Walls must have a solid foundation, be constructed of the proper materials and be built to industry standards thus preventing the wall’s failure. Special attention must be paid to drainage, footing, height, backfill materials and appearance. While we insure a wall has structural integrity, it is obviously important that a retaining wall be visually appealing as well. We can build dry stacked rock retaining walls, mortared rock retaining walls, boulder walls and precast block walls. Often times in Evergreen, Colorado, we will use randomly placed boulders, creating natural terracing in place of a more formal retaining wall. Some sites need concrete walls, and we can veneer the concrete wall with stone or stucco. Landscape timber walls are an inexpensive alternative to rock walls. We recommend rock retaining walls, as timbers have a much shorter life expectancy. At Evergreen Landscape & Design can help you with all your retaining wall questions by just giving us a call. Evergreen Landscape & Design will assist you with assessments of the site’s structural and visual requirements and provide you with experienced feedback on your best options and wall choices.